We offer real ballet training for adults. No matter who you are or what walk of life you are from, we'll help you learn ballet. Dance is a beautiful art form and it is for everyone. It is a powerful way for children and adults, men and women, to push their minds and bodies, develop self confidence, and express themselves. We offer ballet for adults who have always wanted to learn but never had the chance, adults who studied ballet when they were younger and want to learn again, and adults who have been actively studying ballet and are ready to take their technique to the next level. Unlike traditional studios, we only offer intimate and individualized private and small-group coaching to help introduce new dancers to the world of ballet or push seasoned dancers to their maximum potential. Have you always dreamed of ballet but felt like you missed your chance? Are you afraid of being in a class alongside little kids? Do you think that you are too old, too heavy, or don’t have the right body type? Do you feel like you are on the outside looking in to the beautiful exclusive world of ballet? Are you nervous or scared to take a beginner group class? Escape and have a moment to yourself to learn something new, expand your horizons, and chase your dreams in a kind and welcoming environment. Whether you're new to ballet, ready for the next level, or returning from a hiatus, we can help. We offer coaching designed for adults of all shapes, sizes, and skill levels. If you have your eyes and heart set on dancing en pointe, we can help with that too! In most cases, adults can achieve pointe work and live their dreams of dancing en pointe. It doesn't matter if you have two left feet and never danced before in your life. We'll help you every step of the way towards your dreams of learning ballet. 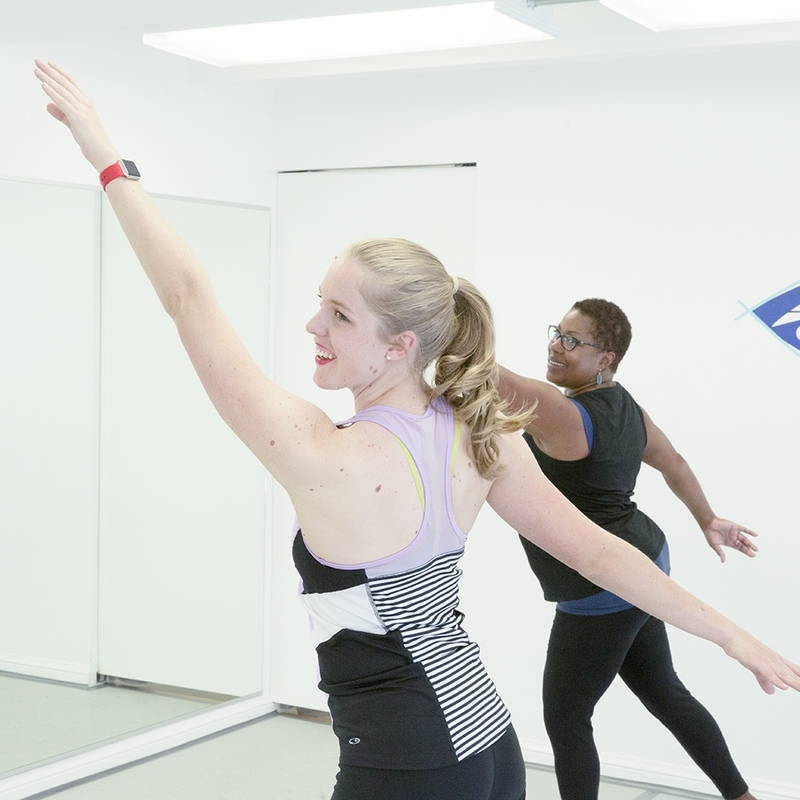 If it's been 30 years since your last class and your knees and hips aren't what they once were, we'll help you get back into the studio and experience the joy of dancing again. If you've been taking open classes and are ready to master tricky steps and refine your technique, our small-group classes can help take you to the next level. to do ballet, you're wrong! Men and women of all ages, shapes and sizes to live their dream can learn ballet and discover the confidence to do what they never thought they could. Don't let your fear hold you back. Even if you’ve never danced before, never lost that baby weight, or can’t touch your toes, it's not too late to learn ballet. Forget the stereotypical exacting and condescending ballet teacher. Enter into our kind, welcoming, and respectful environment and experience instruction that understands and embraces wherever you are in your life. Feel comfortable going out of your comfort zone and expanding your horizons in our private studio setting and one-on-one environment. Our environment welcomes dancers without sacrificing the true essence of ballet technique. This isn’t a barre class simply for a ballet-inspired workout. Learn the purest form of classical ballet and find yourself in the process. Learning beginner ballet as an adult is a very special experience. I came to Julie at a point in my life where I wanted to grow artistically and learn something new. Julie is an amazing instructor. Everything she promised happened, and more. Working with her to develop my personal balletic aesthetic has been one of the most rewarding and enriching experiences of my life. It challenged me physically and mentally and pushed me beyond what I ever thought I could accomplish. The grace that I carry today is from our work together and she never gave up on me even when I felt I wouldn’t be able to master a certain step. She promised me that not only would “I get there” but that “you will make it your own”. Both came true. We offer highly individualized and personal small-group ballet instruction in classes limited to 3 people to give you a personal yet affordable approach to learning ballet. Our detailed instruction, leveled classes, and curriculum designed for progress all help you achieve your goals with ballet.